WSC 2016 provides a unique opportunity to reach key simulation practitioners and researchers from all disciplines in the industry, government and university sectors. Expected attendance is 650+. Click here to review the WSC Exhibitor Terms & Conditions. To view larger size of floor plan please click on image below. You may also download a PDF of the floor plan here. 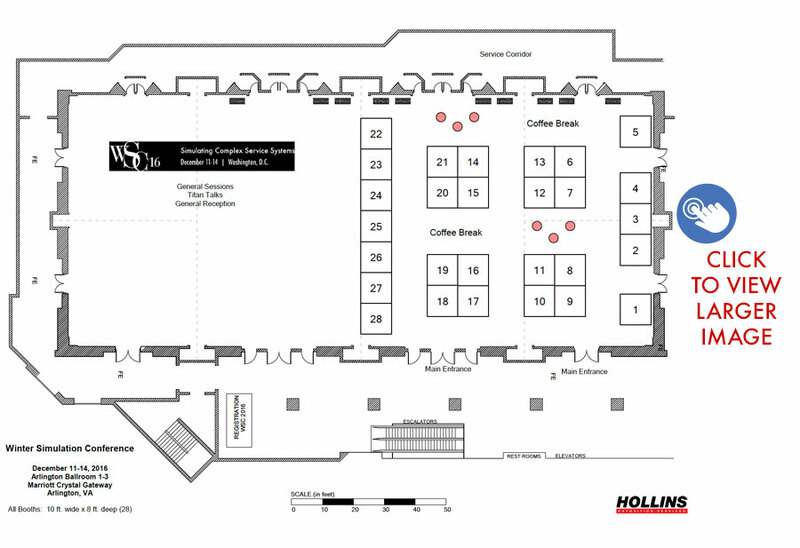 Please note: This floor plan does not reflect booths that are already purchased. Pricing will remain the same in 2016. The Exhibit Fee for booth space is $1,250 for an inside 8 x 10 booth and $1,350 for a corner booth. As in the past the booth space fee is for space only and does not include furnishings, electrical, etc. INFORMS will need to add you as a ‘Company Administrator’ within our system if you are the contact that will be registering for the booth or sponsorship. Please contact Michelle Farace to be added as a ‘Company Administrator’. Once you are added as a company administrator, you’ll be able to follow the instructions below to purchase your booth starting on Friday, May 6. View the Floor Plan and Sponsorship Opportunities to familiarize yourself with the layout, exposure opportunities and terms & conditions of registering for an exhibit booth or sponsorship. Go to INFORMS Self-Service Center page https://acgi.informs.org/sso_login.php, enter your Last Name and Customer ID. You must be listed as a ‘company administrator’ with INFORMS to purchase a booth or sponsorship. Please let Michelle Farace know who from your company should be listed as the company administrator. This will allow you to use your INFORMS ID to process company registration. Scroll down to the bottom of the Self-Service Center Page and click on EVENT EXHIBIT AND SPONSORSHIP OPPORTUNITIES. From here you will select the Exhibitors Portal and then click on WSC Exhibits. Follow the prompts to enter the Contact Details(main booth contact information) , Optional Workshop Description and Exhibitor Guide Description. Booth Selection – Add booth(s) to your cart and proceed to ‘Additional Items’. In this step you can add a Sponsorship Opportunity, select Audio Visual and/or add Additional Representatives to ‘My Cart’. Please note: If you are presenting at a Vendor Workshop on Sunday, you must select AUDIOVISUAL $80. Select payment option (wire/check or credit card) and submit. Once your payment has been submitted, you will receive a confirmation e-mail, sent to the person designated as the primary contact. We are aware that booth personnel are not always decided on until closer to the conference. In order to add booth personnel you must have completed Steps 1-7 and return to https://acgi.informs.org/sso_login.php. Updates to booth personnel must be entered by November 1, 2016.
Credit Card: Now available through the online application: VISA, MasterCard or American Express. Check: Company Check made payable to INFORMS (US dollars) and send to 5521 Research Park Drive, Suite 200, Catonsville, MD 21228. Bank/Wire Transfer: Please contact Michelle Farace, for wire transfer information. All cancellations writing to the Michelle Farace by October 12, 2016 (cancellation fee of $250 will apply). In addition to the Sunday Workshops, registered exhibitors have the opportunity to participate in the Vendor Track at WSC. The Vendor Track provides an opportunity for companies that market modeling and simulation technology and services to present their innovations and successful applications. For each reserved booth, vendors get a 45-minute time slot in the track. For each slot in the Vendor Track, you have two options: submit a complete paper; or submit just an abstract. Abstracts and papers appear online and in the final program, but neither appear the archival proceedings (IEEE rules). Abstracts are lightly reviewed by the track coordinator and papers are reviewed by multiple members of the committee and may entail revisions. Papers and abstracts should use the Authors’ Kit in order to adhere to the publication format requirements. For abstracts, please use the paper template and just delete everything after the abstract (i.e., you should still have the running head, title and affiliations, etc.) The links for submitting papers and abstracts are here. The deadline for submission for abstracts is July 31, 2016. For additional information on the Vendor Track, please contact Jeff Smith at jsmith@auburn.edu. If you have any questions regarding the registration process, please contact Michelle Farace at michelle.farace@informs.org or (443) 757-3556.